Hezbollah's woes worsen as Newsweek report claims Lebanese terror group on the verge of bankruptcy after oil prices plummet. Lebanese terror group Hezbollah is on the verge of bankruptcy, according to a report in Newsweek. The terror group's financial troubles are a fallout from the dramatic slide in the price of oil, the report claimed. 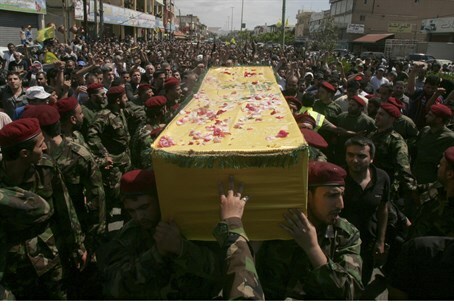 Hezbollah receives most of its funding from Iran, but Tehran - which is losing tens of millions weekly because of the lower prices for what is virtually its sole export - has been forced to cut allocations to “special projects,” like funding Hezbollah terrorism. The magazine interviewed several Lebanese who claimed to be Hezbollah members, and complained that they had not been paid for several weeks. Others said that they were being denied medical care and pensions. In addition, Hezbollah has less money in its “slush funds” to bribe politicians. According to the report, a Druze politician affiliated with the terror group saw his monthly “take” reduced from $60,000 to $20,000, while another's payoff was cut to $15,000 from $40,000. This is not the first time Hezbollah has faced a financial crisis, Newsweek noted. In 2008, the price of oil fell to $32 after peaking six months earlier at $147, and payments from Iran fell by half, according to experts' estimates. With analysts predicting that the price of oil is likely to stay low for the foreseeable future, top Hezbollah terrorists are scrambling to make up the losses from Iran, the report said. But according to Matthew Levitt, an analyst at the Washington Institute for Near East Policy in Washington, D.C., the current crisis is the worst the terror group has faced, the report quoted him as saying. "I think Hezbollah is very concerned,” says Levitt. “When you position yourself as the party which fills these needs, expectations grow." The drop in oil prices is believed to be the direct result of a form of "economic warfare" by Iran's arch-nemesis, Saudi Arabia, which flooded the market with its own oil reserves late last year. The impact on Hezbollah is just the latest headache for the Shia Islamist group, which has endured mounting casualties in Syria, where it is fighting alongside pro-regime forces. Hezbollah was also recently shaken by revelations that an alleged Israeli agent had reportedly managed to infiltrate the group's highest operational echelons.